The series of 'Car Free Day' events, meant to re-imagine and showcase a city less dependent of cars, takes place from June to August. Each festival will be held on a single street in each respective neighbourhood, all to be held on different days, allowing festival goers a chance to attend each of them. This year you can expect even more art, music and activities than before. The West End Festival will be held on Saturday, June 16 on Denman Street from Robson to Davie, featuring 4 new stages. The Main Street Festival will take place on Sunday, June 17 on Main Street from Broadway to 30th Ave, featuring more than 10 stages hosted by local communities and businesses. This year you will find more interactive art installations and children's activities. 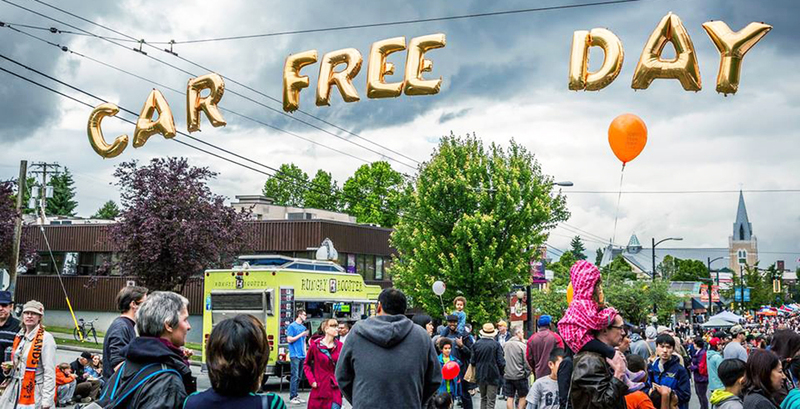 The Commercial Drive Festival will be held on Sunday, July 8th on Commercial Drive from Venables to North Grandview, featuring new and returnng stages put on by community groups and individuals, including a live DJ van. Car Free Day 2018 expects to attract more than 400,000 people out this year.